Who loves Pop-Tarts? 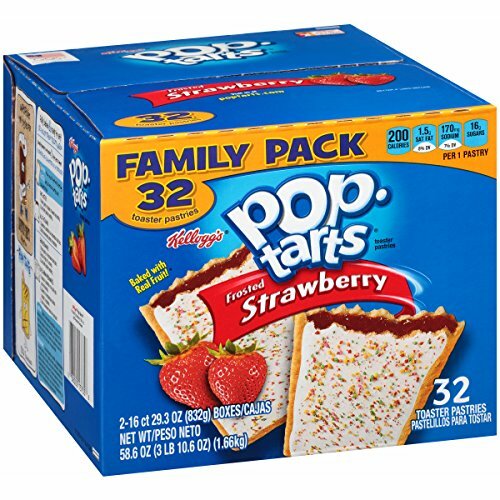 Hurry and get the Pop-Tarts, Frosted Strawberry, 32 Count, 58.61 Ounce for just $6.20 from Amazon! That’s only $.19 per pop tart! Check out all of the Amazon deals here! Get FREE shipping (2-day for Amazon Prime members) when you purchase $25 or more of eligible items across any product category. Get the Pop-Tarts details below. Kellogg’s has been making great-tasting, high quality foods for over 100 years, including Pop-Tarts…a breakfast favorite of millions since 1967. Whether toasted or enjoyed right from the pack, Kellogg’s Pop-Tarts make mornings and snacktime fun. These tasty tarts pack delicious strawberry flavor into every bite. Kellogg’s Pop-Tarts are baked with real fruit. Wrapped in convenient two-tart packs, Pop-Tarts are an easy pick for a quick lunchtime recharge or snack on-the-go. This package includes one 32-count box of Kellogg’s Frosted Strawberry Pop-Tarts. Buy the Pop-Tarts, Frosted Strawberry, 32 Count, 58.61 Ounce from Amazon. Previous articleGlad Food Storage/Freezer 2 in 1 Bags (Stock Up) Deal!